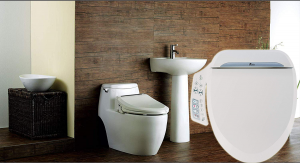 On this page, we are going to take a look at Toto sw2014#01 a100 washlet electronic bidet toilet seat which a very nice bidet toilet seat for the price. We will take a look at the features of this luxury bidet toilet seat as well as the customer review and opinions. No better way to get a feel for the seat before buying is reading what other’s who have purchased have to say both good and bad. I will also tell you where to purchase from so that you get the best price, best service and fast delivery. Are in a hurry and not interested in reading a full review on the TOTO SW2014#01 A100 WASHLET Electronic Bidet Toilet Seat with SoftClose Lid? If that is the case just click on the link below and go straight through to Amazon.com where you will be able to see the product page directly, all the features and you will also be able to read the customer reviews of this product. If you are still with us Read on to get a full review of the TOTO SW2014#01 A100 WASHLET Electronic Bidet Toilet Seat. The Toto a100 washlet electronic bidet toilet seat provides comfortable warm water that you can adjust to your own liking and settings. With just a touch of the button once you have finished your business the Toto a100 washlet will give you a nice cleansing. The days of using toilet paper are gone when using this bidet toilet seat. The seat is a standard elongated size that will fit most standard toilet bowls that takes elongated seats. Having a temperature controlled toilet seat is perfect for those cold winter trips. Just adjust the temperature to a setting that you’re happy with and in the summer months just turn it down. The only thing is you only get 3 settings for the heated toilet bidet seat. It’s not a biggy, maybe I’m just being picky. With its new sleek slimline control panel, everything is push button and as soon as you sit down on the throne you have full control. I like the idea of having the control mounted to the seat at least then no remotes can be lost or dropped. Better idea for those who are limited in mobility or those who have arthritis and trying to grip a small remote. You can though adjust the water temperature to your own liking and the pressure and volume too. The water is injected with air to enlarge the droplets and create a superior cleanse without being too harsh. Water is fired at different speeds, allowing smaller droplets to collide with larger ones and fill with more air. Installation is rated very easy and the toilet seat comes with all parts for the install. One feature I like is the quick release system that it has. Makes installing so much quicker and for cleaning the quick release system comes in its own then. Just a touch of a button and it’s off. It makes everything simpler to clean even those tight little spaces where it was a pain to clean on other toilet seats. This one sure one way to upgrade your bathroom with its latest cutting edge looks and technology. No more slamming of the lid or seat either as the Toto washlet a100 has soft closing feature build in. The controller runs on 2 AA batteries that you will have to supply yourself. It’s recommended by the manufacturer to use alkaline batteries. The reviews of the Toto a100 washlet on Amazon.com are mainly 4 and 5 stars with an average of 4.2 stars which is a very high rating. With over 100 reviews the 84% of those reviews are positive and really love there new bidet toilet seat. One of the reviews says that after a month of heavy use that she regrets not buying a model with air dryer. 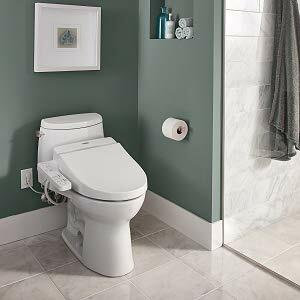 She even goes to say that the Toto a100 washlet seat makes the toilet look like it’s from the future☺. It was easy to install but a downside she did say is that TOTO SW2014#01 A100 WASHLET Electronic Bidet Toilet Seat takes more maintenance than a regular toilet seat. So far so good and rates it a 4 out of 5. This review is a 1 star due to because it’s junction valve. The first day, I spent 3 hours on its valve and could not fix the water leak. The reason is that their washer provided is not enough. Overall the TOTO SW2014#01 A100 WASHLET Electronic Bidet Toilet Seat is good value and a very comfortable unit. It’s a good starter bidet if you are looking for a just above average seat. 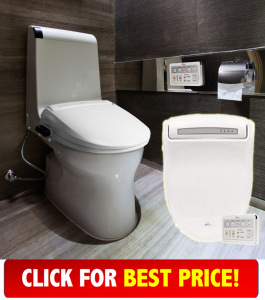 For extra few dollars and a far Superior luxury seat with an air dryer, you should check out the Bio Bidet Ultimate bb 600 Advanced Bidet Toilet Seat. Which also is our top choice and the best value for money on Amazon.com right now at the time of writing.